Self awareness meditation for living in the present, teaching powerful grounding techniques and other life-changing skills. 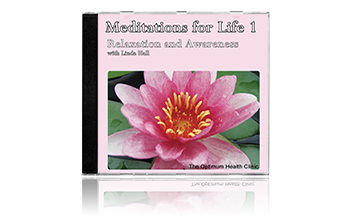 Meditations for Life 1 contains mindfulness meditation self awareness techniques for relaxation and living in the moment. May also be beneficial for stress related conditions or chronic illness. Three uplifting guided meditations connect you to the natural world around you and put you in touch with your inner resources to enhance your sense of balance and wellbeing. Mindfulness meditation is a recognised means for personal development, helping you live in the present with greater awareness of the positive choices the present moment offers.This guided meditation product aims to help you relax and feel more at one with yourself and life. Whether you require help with managing your stress levels, are looking for support during illness or just want to get to know yourself better, Meditations for Life has something special to offer you. Set to soothing, hypnotic music, the overall tone is grounding and reassuring. 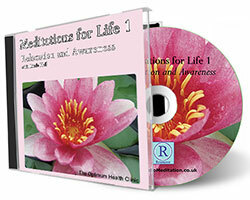 "Meditations for Life 1, Relaxation and Awareness CD does just that. As my thoughts slowed down I felt safe and secure, and, with Linda's help, I found I could release the physical tensions within me." - Delcia McNeil, Author of 'Bodywork Therapies for Women'.